I am going to admit it...I am chubby. I haven't always been this way, but I am definitely living that life now. I love food! But it finally came to a point where I needed to do something. I joined Weight Watchers at the end of July and am happy to say that I have lost almost 12 pounds so far. I am pretty proud of myself! It feels like a big accomplishment that I am worked for a little bit at a time. I like see a double digit total weight loss. But I still have a long way to go before I can concentrate on maintaining my weight. It isn't fun controlling portion sizes and monitoring everything that goes in my mouth. But it is what I have to do right now so I can be healthy. That is really the ultimate goal and being a smaller person is a fringe benefit. Besides posting this on my blog, my mom is the only other person that knows I am doing this. I want to surprise my brother when I see him at the end of September so he can be proud of me. He is healthy. He runs half marathons and eats right, but he also knows that it is okay to splurge once in a while. I was on the path that was more about splurging every time I ate. My clothes are starting to feel a little more loose. While no one has commented that it looks like I am loosing weight, I can see a difference. I am not doing this to please other people. This was my choice and I am doing it for me. The next phase to ramp up my weight loss has be exercise. I am not looking forward to that. I am going to start with walking. Since my family will be celebrating Thanksgiving at my place this year, I am going to see if my brother will do the Pittsburgh Turkey Trot with me. That will give me a little motivation to get my tail in motion. But until I embark on the exercise phase, I am going to continue to track what I eat so I can continue to make this time successful! Are there dates in your life that all the sudden have a new meaning? Yesterday was one of those dates. I woke up like any other Thursday until I read the text message my brother had sent several hours earlier. "At the hospital. Baby is coming soon!!!" That message completely changed my perspective on the day. And then a few hours later, I received a picture of my beautiful, newly-born niece, Brynley Cadence. To say I was beaming would probably be an understatement. This precious little girl had made her entrance into the world after months of anticipation. August 22 now has new meaning. As a family, we will celebrate her birth for, God-willing, years to come. Her birth gave me a new title...aunt. I look at my aunts to see the special places they have in my heart. Of course, I am closer with some more than others, but they are women I love dearly. Since my brother lives in Wisconsin and I am in Pennsylvania, I am not going to meet my new niece until the end of September. But I can't wait to shower her with love and spoil her. Since isn't that my job as an aunt? Spoil her rotten and then give her back to her parents. I am so excited to be an aunt, but I am more excited to have a niece. I am at a point in my life where I don't know if I want my own children. However, that doesn't mean that I don't want to be around kids. So I figure that being an aunt is the best of both worlds. It is hard to believe that my brother is a dad. Even before Brynley was born I could see how much my brother was enamored with her. She has him wrapped around her tiny little finger. My brother and I were fortunate to have a dad who loved us and wanted to spend time with us. Unfortunately, Brynley is not going to have the opportunity to meet him, but I know that my dad's influence will show through the way my brother loves his little girl. The brother of a friend of my mom's had a dog that had a litter of puppies. These puppies had the most adorable little faces. I wanted a dog, but figured I would rescue one. I really wasn't interested in getting a puppy. But these faces...I couldn't resist. There was one girl dog and I wanted her to be mine. My mom lives in Ohio and I live in Pennslyvania. 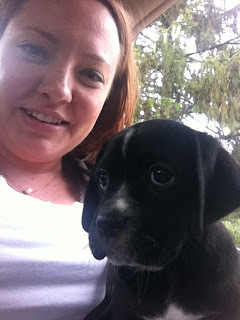 I was attending a wedding the next weekend, so I would have to wait until the following weekend to pick up the puppy. This was fine with the seller. So the next weekend, I made the 4-hour trip to Ohio. After I arrived, my mom had to tell me that the seller didn't want to give the puppy up. They had grown attached to her. My mom's friend was trying to help out by texting and calling her brother, letting him know that this wasn't right. But he wasn't budging. I was devastated, sobbing because I wasn't going to get this dog. Because I had grown attached, too. Thankfully the next morning, my mom's friend called and said she had the dog and we could come and pick her up. Oh, happiness!! 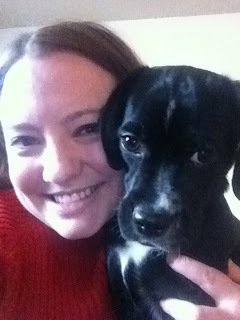 That morning, we picked up my new precious little puppy who I named Luna. Her full name is Luna Starr (2 r's) Jones. I actually can't believe that a year has passed already. She is my little buddy. We have definitely had our ups and downs. Potty training was not fun. But she is a smart dog and LOVES people. Currently, we are in the middle of a beginner training class. It has been a challenge for both of us, but we are learning a lot. Just like in anything, it takes consistency. And that is a struggle for me. I have to be consistent so Luna recognizes the commands I give her. I have to work with her at home. She isn't going to master the commands in an hour-long class once a week. It is going to take time and lots of treats, but eventually she will understand what I expect her to do. It takes practice so she learns the behavior. That is one area I am working on as I participate in an online Bible study through Proverbs 31 ministries. It would be so easy for me to slip off the track and no one would notice. Over 24,000 thousand woman from all over the world are participating. So if I drop off the map, it wouldn't make a difference, right? Wrong! It would make a difference for me. I would miss out on all the blessings of being a part of this community of woman who want to say yes to God. I am struggle with doing daily devotions and spending time with God. But I can easily fill my time with things that I don't need to do. I have really enjoyed working on this study and it has only been one week. Hopefully, this excitement will keep me going, so that I will learn the behavior God expects from. So I will keeping working with Luna on her behavior and keeping working on mine as well. I had a pretty crummy day at work yesterday. I was frustrated with people who thought they should do my job, which I then had to fix what had been done. One of the programs I use to create a newsletter was not cooperating with me. And then traffic was TERRIBLE on the drive home. People were not always courteous when trying to get where they needed to be. Unfortunately, I was also not very courteous to other drivers on the road. I just wanted to get home and stay home. However, that isn't an excuse to be a mean driver. My mood significantly changed when I pulled into my driveway. On my porch was an Amazon box. I had been tracking the package and thought it was going to come today, so it was a pleasant surprise. Inside this box was my order of plastic containers! I know that does sound too exciting, but I was a happy girl. Let me explain a little bit. I am an avid Food Network fan. A couple of my favorites are The Pioneer Woman and Barefoot Contessa. Specifically on Barefoot Contessa, Ina Garten uses similar plastic containers. I liked the size of them because they aren't bulky. And the best part is that they all use the same lid, which will hopefully be a blessing in my very storage-limited kitchen. So now that I have all these storage containers, I need to fill them with stuff. I have grand visions of making my own chicken stock and taking advantage of summer's bounty by making my own pesto. These will also be great for soup and chili, which I like to make in the colder months, which are quickly approaching. Once I wash them, they will be ready to use. I am excited to start making things to put in them. I am hoping to have a stocked freezer with all kinds of yummy things.